The digital board game and tabletop genre continue to advance as top publishers like Asmodee bring their collections to consoles and titles like Armello and Hand of Fate outline success on consoles & PC. This breathes life for newcomers into the genre, and one such company is Numizmatic, bringing a multiplayer tabletop game to the Nintendo Switch entitled Light Fingers. With the ability to play on the TV or the Switch itself, you can get your game on anywhere you like. 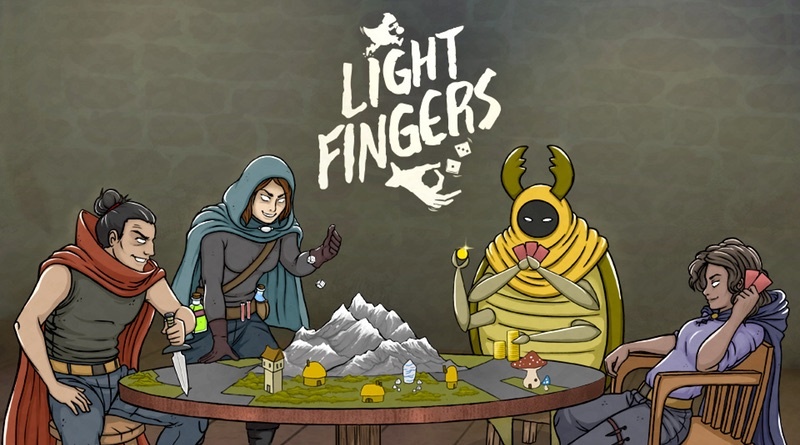 Light Fingers is a multiplayer centric tabletop inspired game, where players take on the role of thieves attempting to steal loot and safely bring it back to the thieves’ hideout. The premise may be simple, but achieving this goal requires strategy, planning, and on occasion, some backstabbing of your opponents. There are two main modes to the game: the primary one being Board Campaign, and the other Dungeon Rush. Board Campaign is the heart of the game for you and up to 3 other local players. At the beginning of a round, you’ll be told to collect a certain amount of loot that must be safely returned to the thieves’ hideout in order to win the game. You’ll have 25 days (rounds) in which to do this, or the AI controlled Guild Master, Kaw, will decide a winner for you. In the many times I played, my group came close to the 25 day mark, but never hit it without a winner declared beforehand, so it felt like an appropriate threshold. Light Fingers shines the most in the tabletop presentation. The game is set atop a large turntable where at the beginning all tiles are face down. You’re allowed to move around the ring of the table in either direction which is 4 tiles in width. With every move you’ll be able to reveal a new randomized tile. Should the player interact with a tile, such as one with a building displayed on it, the whole tile will rise into the air via mechanical arms, and the building will unfold mechanically as well, revealing the interior, similar to the Game of Thrones introduction. Great attention to detail was taken here and it truly shows. Even when the character leaves the building the tile must mechanically go back down to lock into the board. You can move your character to any edge, and they’ll hang off the tile while it compresses back into the board, shifting weight on that corner of the tile where the player is hanging. I found this to be a perfect touch to the games visual identity and interaction. Thieving gameplay itself is quite straightforward, but yet highly competitive. Should a player steal loot from a shopkeeper, their wanted level will go up, causing guards on the board to give chase and potentially arrest the player, returning the treasure that was stolen. There are other ways to steal, like from other players either via a mini game of who-can-press-the-button-fastest, or by using a sneak token. Lastly, there are dungeons that offer more than one bag of loot at a time, in the form of modular platforming runs. Here the player that entered must make it through a stage with varying degrees of difficulty to the end to gain two or more loot bags. However for added challenge, and to give the other players interaction in this moment, they are able to control and influence traps such as spike saws, opening gates for character combatants, and more. It’s high risk, but with it also comes high rewards. My biggest complaint to these dungeons is that in the standard rules, the AI Dungeon Master Kaw also plays as one of the defenders, triggering traps. Only creating a custom rules game would allow me to disable this. These same dungeons are also what make up the entire other game mode, Dungeon Rush. This mode was the only one that also allowed single player gameplay in which you play as the thief, and Kaw the AI will play as the defender, triggering traps. I found myself quickly disliking this mode however primarily due to the difficulty ramp. Each level is created using modular obstacle pieces in a randomized order. This led to many levels not having the checkpoint pieces in any meaningful position, and also incredibly long levels in which you were repeating the same modular obstacle half a dozen times or more. Given the dynamic nature, every time you lost all lives, and were forced to restart, you’d be playing a different layout. The reward for playing this mode time and again is to gain coins to unlock more traps to be utilized, which ultimately felt like a forced progression. I can fully understand why this mode was created, but I can’t imagine players spending most of their time here. I was actually surprised, and disappointed, to find this game omitting single player from the main Board Campaign, and only allowing it in the Dungeon Rush mode. Similar to games like Armello, I can easily see this still functioning quite fine with AI controlling other characters on the board. This is a game I would have loved to play a few turns while traveling or on a lunch break. I can only hope that this might be an upcoming feature, but it wasn’t enough to detract me from enjoying a great local multiplayer experience. Numizmatic has created a great digital board game for a console focused on friendly local gaming. The game rules are simplistic, but ripe for strategy, and it’s accessible to many age groups. The entire presentation, art style, music and theme are well purposed & crafted beautifully. Since the game’s tiles are dynamically placed each match, similar to a real world board game, you’ll be replaying this one often. When the standard rules start to wear thin, you can even create custom plays with various options to make the game more challenging. Furthermore, I can also see immense opportunity for new tables, tiles, strategic cards, and even characters to expand this game further. Light Fingers works well on many levels and offers a great lightweight tabletop experience for you and your friends for $19.99 at the time of this writing. I’d definitely recommend checking it out. Numizmatic has delivered a good entry into this genre with Light Fingers. They’ve managed to hit a sweet spot for a more medium-core digital table top game focused on local multiplayer, but I can’t help but feel there was a strong missed opportunity for a solo mode in the Board Campaign. Beyond that, the game has some areas that could use additional polish or more depth, but the Nintendo Switch is the perfect system for what they have created. Light Fingers was reviewed using a final retail Nintendo Switch download code provided by the publisher.